“Our plan is to continue to grow the economy and to continue to have a very strong and robust and welcoming immigration system,” the Treasurer said, after agreeing on measures with the states to plan for population growth. He said immigration was also critical in mitigating the challenges of an ageing population and “it will continue to be strong here in Australia”. “We continue to not get our fair share of infrastructure investment,” NSW Treasurer Dominic Perrottet said. Mr Pallas said the meeting raised questions about the “carrying capacity” of each state when the answer depended in part on the Commonwealth’s ability to fund new road and rail projects to accommodate more people. “This reinforced the fact that we can’t have a discussion about migration in isolation. The Commonwealth needs to back up its interest in the area with a commitment to help fund infrastructure in the states,” Mr Pallas said after the meeting. The vertical fiscal imbalances (VFI) surrounding the federal government’s mass immigration ‘Big Australia’ policy is at the heart of the issue. As the federal government receives 80% of Australia’s tax revenue, it sees mass immigration as an unambiguous positive, since it collects the lion’s share of the financial benefits via personal and company taxes. The states, by contrast, are left carrying the cost of infrastructure and services to support population growth (think roads, public transport, schools and hospitals). Analysis by the Grattan Institute in 2014 showed that “unprecedented infrastructure spending by states and territories” since the escalation of population growth from 2004 is “largely responsible for a $106 billion decline in their finances since 2006“, and that “after a threefold increase in capital spending over the last 10 years, states are paying 3 per cent more of their revenues in interest and depreciation”. Separately, Grattan executive director, John Daley, recently noted that “state governments were struggling to deal with rapid population growth in their major cities and the quality of life of residents – represented by the rapid growth in house prices in recent decades – was suffering”. To date, the states have ‘managed’ these costs by shoving massive infrastructure spending off balance sheet, including through privatising assets via budget tricks like Public Private Partnerships (PPPs). In the process, this has created substantial hidden costs for residents – effectively private taxes – via things like tolls and user pays charges. 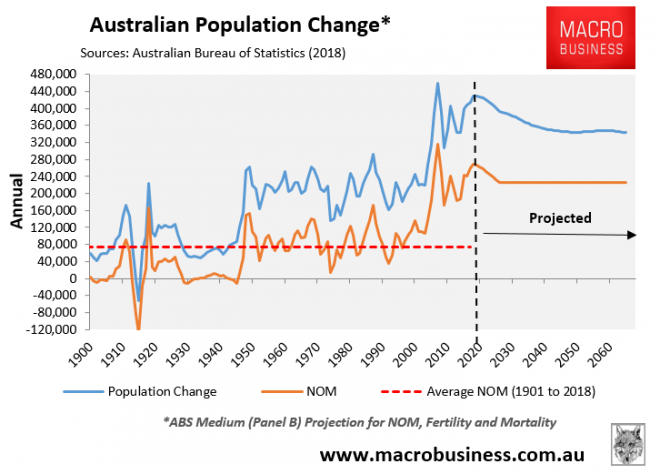 Infrastructure provision has also failed miserably to keep pace with population growth, as explicitly noted by Infrastructure Australia in December, resulting in crushed living standards. Basically, the whole political structure around immigration is dysfunction because of three tiers of government, entrenched VFI, diffusion of responsibilities, buck-passing, etc. So making the federal government internalise the costs of mass immigration is a key to forcing it to moderate the migrant intake. Until the federal government is directly exposed to the costs of mass immigration – by bearing the costs of economic and social infrastructure – then it will continue to run the program at a turbo-charged rate. Are One Nation even around anymore? Never hear anything from them on topic. Maybe the press has blacklisted them. Mark Latham apparently a shoe-in for the NSW upper house at upcoming state election (source Antony Green). A few more articulate representatives who can string words together better than old “Poorl-ene” (please explain!) and they may yet experience a resurgence. I’m going to be holding my nose while I put PHON as Number 1. And I shall not be telling family or friends even though I imagine many will be doing the same. Do away with states perhaps so the federal government feels the burn? The states should simply tax the foreigners. $40 per day for a train ticket and $100 per day for car parking. Just about every rich nation is less than 29% foreign-born. Norway and Iceland are not horrible places. Iceland has less than half a million people and it also has cheap electricity that it uses to export aluminium. Iceland would have a lot less geothermal energy per capita if it embraced mass immigration. Aussie states should be cutting immigration instead of demanding more money to deal with problems caused by mass immigration. Iceland was a horrible place a decade back. Perhaps that’s what we have to endure to see sense? Who cares about shareholders. Iceland has universal healthcare and USA does not. No idea what your post has to do with mass immigration. Venezuela has universal coverage too. May I suggest a simpler solution? $100 per little of water for foreigners and a gold/green band on the upper right arm so that anyone can stop them and confirm they paid for that water.they can do without parking and public transport, can’t do without water! Or we could issue every new arrival with an unbreakable neck collar that explodes precisely upon the expiry of their visa. Turn on to Marsh Street and we’ll merge into Airport Drive. It would only need to happen once to be effective. Djenka is a globalist who does not want to charge foreigners extra for a train ticket. LOL…. I’m as globalist as much as Zuckerberg is altruist. Nope, not even as much as “it” Zuckerberg, even less. but yep, much the same as I would oppose Aussies being charged 100 bucks for public transport anywhere in the world, I oppose the same exuberance applied here. But I thought you’d applaud the proposition that cannot be cheated (unlike your that would allow foreigners to go by foot or not use a car and instead use our pathways, sidewalks, kerb etc for free. Charge for air and water and K.I.S.S.cannot game that. Instead … they tax the locals! Scummo IS the very definition of a sham. He is a fully paid up toady of the banks and business. He is the epitome of everything that is wrong with Australia. Yes Gramus, no pretense at all. It’s the MSM who keep hiding the shenanigans, dividing us, when all of us are in the same boat heading toward the waterfall. The call to turn around is loud, but sheer greed and arrogance gets in the way every time. In particular, Bolt. Panahi, Gotti, McCrann etc at News plus Domain9 journos, are well paid to run interference on any thing that does not suit ipa/Rup. As one dear old bearded bloke said long ago “the contradictions in the system”. Well, as I have stated in the past, the harder and longer they keep pumping the ponzi, the more political-economic contradictions there are going to be and eventually there will be a general explosion of anger that it will throw “our” scumbag political system into chaos. The confusion and arz covering is already evident among “our” third rate parliamentary scumbag leaders Good, that will fix thing – after a decade or so. Perhaps. If it doesn’t – hello Argentina!. Finally, and perhaps most controversially, I believe we must aim to build a Big Australia. Neither maximum workforce participation nor productivity growth alone will generate an economy large enough and a workforce young enough to pay for the country’s future. The ageing of our population is real. The impact on future retirement income, health and aged care costs will be prohibitive. These cannot be wished away. This leaves to one side the future cost of our national defence. For Australia to sustain its future standard of living and meet its future social policy and national security policy needs, we will need a much larger population. That’s why we need to plan effectively for an optimum population size. A big Australia is not incompatible with properly mandated urban planning, infrastructure development and environmental sustainability. Nor is it incompatible with the development of new population centres in the water-rich northern parts of the country. Nor does it prevent mandating new migrants to move to these regions rather than the capital cities to avoid over-crowding. All this is doable. And at a pace and composition of migration flows that maintains social stability on the way through. Of course there will be vigorous reaction to this proposal. There has been in the past. That’s because everybody is running for cover while no-one is answering the core question – that in the absence of continuing significant migration flows, who on earth is going to fund our most fundamental future national needs, from health and aged care, to retirement incomes to national defence in an increasingly unstable region. We run the risk of being a young country which becomes old before its time. These are the seeds of national decline. I think the current government is the worst government in Australia history and they deserve to be roasted on election day. But I also think voting ALP is simply vote for what Kevin Rudd has openly called for. Gunna they r both terrible and treasonous. I actually have no problems at all with bringing everyone off Nauru and to Australia. I think Australia’s immigration framework currently makes it far too easy for legitimate visa applicants to bring family members (particularly aged family members) to Australia to represent an impost on Australia’s health system, which they have never contributed to the funding of, and which subsequently represent a burden on Australian taxpayers now and in the future. I think Australia’s immigration framework currently enables those coming to Australia, often for completely meaningless educational reasons – where the education will not make any significant contribution to Australia (and most likely the individual) – to subsequently become a resident, which leads to the deformity of Australia’s once well respected education system. I think in the overall scope of things the people on Nauru are a fairly minor issue and that the national obsession with those on Nauru is effectively a look over there ploy by those profiting from the far larger population Ponzi mechanisms. I hope that explains my thoughts. Add to that once the lefts guilt about the vile way we treat legitimate asylum seekers is assuaged , it will be far easier to convince them to cut immigration. Which is no doubt the precise reason it hasn’t happened yet. I’ll take a grateful Refo over a Cashed up wealth Immigrant or a fifth columnist on a student Visa any day. All of the negative effects of our Mass Immigration, bemoaned by so many on this site, have FA to do with Refugees. Unbelievable that so many are still being fooled by Howards Bait and Switch. After all this time, this obfuscating side show (Nauru/stopping the boats) continues. Onshore immigration detention is a whole lot cheaper. Plus access to good medical care. Nothing stops us from continuing to lock them up if this remains the government policy. Offshore processing has become an ideological rather than intellectual issue, with predictable results. Akin to the climate wars. Why doesn’t he look at the reasons why the existing population aren’t having children (and compare that to other countries) and address those issues. Crush loading the country by importing developing world living standards does not necessarily follow from what he outlined about fiscal issues etc. Outside of Africa, no one else is having children either. If it’s that it’s extremely difficult to find a country where most girls finish high school and there’s above replacement fertility it’s not a secret – large groups of women with high rates of literacy almost always have low rates of fertility and the opposite is also true. Yet as always planning and environment are optional in the big Australia roll out, and an option almost never taken. If they were hard wired to the growth then maybe. Not even cynicism is required to dismiss this rubbish from Rudd, there is absolutely no evidence to support it. Yep more housing on flood plains, what could possibly go wrong ? Well make them high rise , that will fix it. Ponzi schemes should be illegal for the government/banks(same thing) as well. Problem is they aren’t. What this means is that the scoundrels recognise the problem and have decided to blame other people but do nothing themselves to solve it and hope that this will win them votes. I won’t be voting for these scoundrels, and neither should you. A decent federal politician could reasonably blame the state govt for not coping with the high immigration. This decent politician would then reduce immigration to match the poor performance of the states in order that innocent citizens did not suffer. A decent state politician could reasonably blame the federal govt for excessive immigration. This decent politician would then try to build sufficient infrastructure to cope AND would take smart steps to deter immigrants from their state. For example higher charges. A scoundrel federal politician would blame the states and do nothing. A scoundrel state politician would blame the federal govt and do nothing. Han Solo: Hey, Your Worship, I’m only trying to help. Princess Leia Organa: Would you please stop calling me that? Princess Leia Organa: You make it so difficult sometimes. Han Solo: I do, I really do. You could be a little nicer, though. Come on, admit it. Sometimes you think I’m alright. Princess Leia Organa: Occasionally, maybe… when you aren’t acting like a scoundrel. Princess Leia Organa: Stop that. Princess Leia Organa: [timidly] Stop that! My hands are dirty. Han Solo: My hands are dirty too. What are you afraid of? Princess Leia Organa: I’m not trembling. Han Solo: [moving closer to Leia] You like me because I’m a scoundrel. There aren’t enough scoundrels in your life. Princess Leia Organa: I happen to like nice men. Han Solo: [moving closer still] I’m a nice man. C-3PO: [interrupting] Sir! Sir! I’ve isolated the reverse power flux coupling! Han Solo: [annoyed] Thank you! Thank you very much! C-3PO: Oh, you’re perfectly welcome, sir. Did you cut and past that bit of Star Wars dialogue,… or did you tap it out from memory? I better not associate Abbott with that scene next time I watch it! Is there any way the states can impose a tax/charge on the federal government to pay for the immigration? They have no power to tax the Commonwealth directly. They can tax people residing or doing business in their state only, which would have obvious ballot box implications. Even that might not be too quick or simple – the states have largely ceded taxation powers to the Commonwealth. If they were obvious that they were imposing charges on somebody to prevent the Commonwealth’s desired policy outcome e.g. if NSW and Vic found a way to tax migrants to such an extent that migration slowed -the Commonwealth could (and probably would) retaliate by diverting GST and income tax proceeds away from the recalcitrant state or states. not sure if states could introduce immigration quota based on the infrastructure money received from fed. Perhaps Fed .gov should pay states and terfs per immigrant approved? Have a ‘closed loop with negative feedback” deal. Why would the commonwealth agree to a deal like that when currently they get all the benefits (e.g. from the expanded income tax base and juiced GDP figures) while taking none of the responsibility (seeing as the states have the job of running schools and such)?